Earlier this year, LinkedIn reached 200 million users worldwide, gaining traction in non-English speaking markets as the professional network of choice. Meanwhile in German-speaking Europe, Xing continues its growth clocking in at 12.5 million users globally. If you live in Switzerland, which network should you focus on? Current statistics show that Xing has 600’000+ users in Switzerland while a quick Google X-ray search of LinkedIn profiles show over 1.2 million members. And that’s just the indexed profiles. By comparing the search volumes in the graph below, it’s apparent that interest or at least brand awareness for LinkedIn is on a steady rise in Switzerland. In comparison search interest for Xing which peaked in 2009 has since reached a plateau. The search volumes can also be used as a rough measure of the daily traffic that each site receives and is a good indicator of the level of activity generated by the registered users. It remains to be seen whether Xing can expand their reach to match LinkedIn’s presence in country where language easily defines preferences. 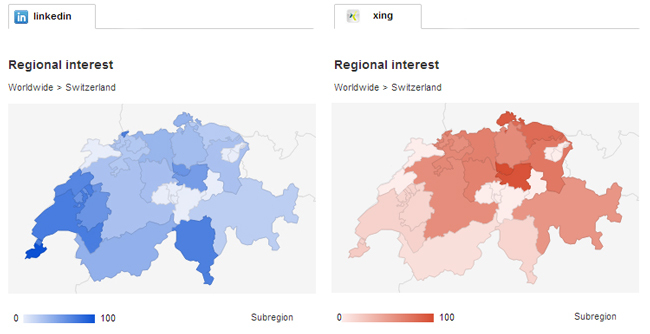 A drill down to subregions shows Xing’s popularity in the German speaking parts of Switzerland; while LinkedIn’s penetration, though overall proportionally greater, is still most pronounced in Suisse Romande and Ticino. Both networks are aggressively going after business customers as they expand their offerings to include employer branding and more robust recruitment tools. LinkedIn has had several changes on the platform this year including an overhaul of the profile pages, homepage, search engine and a complete redesign of their mobile app. Other notable changes include acquisitions of companies such as Pulse and Slideshare which integrate beautifully with the LinkedIn ecosystem to expand content accessibility. Meanwhile Xing is trying to keep pace with UI changes as well as the recent release of Talent Centre and the acquisition of the employer review site Kununu. They have also recently opened their first local office in Switzerland which shows the company making big strides to regain and retain market share before LinkedIn takes over completely. Whether Xing will succeed as a sizeable competitor to LinkedIn or fold to turn into a smaller niche social network is something yet to be determined. (27.03.2014) Erratum: An earlier version of this article stated that LinkedIn has 1.4 million users in Switzerland. Contrary to that statement, as of March 2014 there are only 1.2+ million users on the network. 6 Responses to Xing Vs. LinkedIn, who’s winning the battle for Switzerland? I noticed these differences by making some searches on XING and comparing with LinkedIn searches, very nice article Maebellyne ! Thanks. I think the next step would be to find out how much of an overlap there is between the two networks as some people are bound to have a profile on both platforms. Wonderful article. Thanks for sharing it. I think that Linkedin is far advanced comparing with Xing. However Xing is also interesting. Thank you Maebellyne for this great article. Many people have accounts on both linkedin and xing, slowly people will opt for one and close/ignore the other making the weaker of the two diminish. Nice one! Personally prefer LinkedIn by FAR. I am looking for a publishing tool by the way, just like Hootsuite, but one that supports XING. Are you aware of any?